To most people, a flight of stairs is just THAT - an environmental object that can be used to take you from a lower point to a higher point, or vice versa. But to a fitness professional and a gym-less training advocate like myself, I like to see beyond the humble usefulness of stairs in our daily lives to something more extraordinary, to something that can be surprisingly and tremendously useful to the average man/woman who wants to lose weight, fight flab, increase speed or agility, or to simply improve overall fitness! Frankly, in my personal opinion, I think that stairs training has been greatly over-looked by the Singapore fitness community at large - even by us, the so-called gym-free brigade. Perhaps it 's due to the fact that stairs are such common place environmental objects that few if any, really pay much attention to them, much less even think of using them as a fitness training tool. 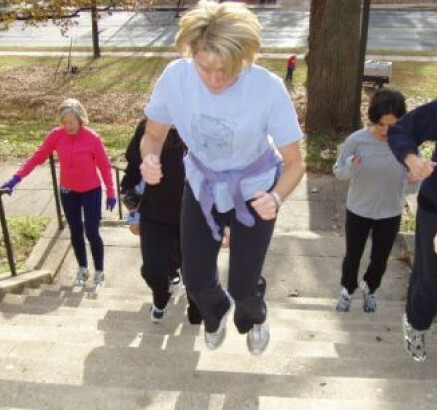 Whatever it is, stairs training - if properly harnessed - can indeed be a SUPERB tool to help you hone your physique and accomplish your fitness goals. And the BEST part of it all is: stairs-training is simply just so very convenient! So, there is simply NO excuses as to why one shouldn't utilize stairs as a fitness tool. Do you know that there are actually TONS OF MOVEMENTS that you can do on a flight of stairs - besides just running up and down them???? For example, you can HOP - either one-legged or two, move SIDEWAYS up the stairs, or LUNGE your way up, or perform CROSS-OVERS as you go up, or even BEAR-CRAWL up the stairs and then CRAB-WALK down them ..... and that's such a few off-hand examples to get going!!! !